Many companies in reality are overstaffed while at the same time, there is a lack of good and productive people. And companies with a complex organization often have difficulty in overseeing and updating their overall set-up – particularly those with a large number of different staffs, different divisions and many daughter firms in different markets. BSAG has developed a unique, simple and highly useful IT tool for easily overseeing, updating and rationalizing complex structures and for keeping in just one place a multitude of information on the organization and its people. Many large, complex and international companies are faced with complex and growing organisation structures where charts are stored in different places, difficult to oversee easily, and sometimes nearly impossible to update fast enough in a simple fashion. Also, growing companies often see an increasing need to simplify or “harmonise” their multitudes of structures, different reporting relationships and varying titles for similar jobs. Understanding structures is a well known problem — especially, but not only in concerns acquiring a new company or entering into cooperation schemes. We often have seen different kinds of data stored partly centrally and partly under each company, department or person – which often involved complicated updating. Too frequently it takes time and trouble to get quick and relevant answers to even simple questions each time a major or even minor reorganisation is taking place. Business Strategy BS AG can help solve the question of structures and personnel data in a new and better way. We recently took steps to develop a possibly unique, IT-based tool for use by client companies. As the name “OneFile-MultiClick” indicates, the purpose is to put all company structures and charts into one single file. Here, each individual company or function can easily be addressed by just clicking – chart by chart, level by level or person by person. And for each person, key data can be stored “behind” the box that shows the person’s job and name. The single IT file can be put on the Intranet, Extranet or Internet. By permission, it can be made individually accessible by top managers, selected persons, and of course HR departments. Or each function can access its own data. 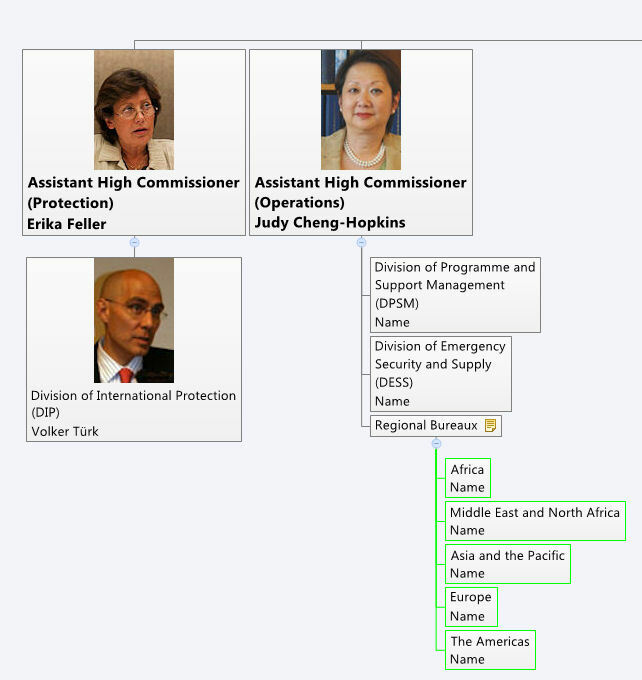 We illustrate our use of OneFile-MultiClick through a multi-level structure within United Nations in Geneva which is displayed on the web. Please click here to see this sample chart.